Search engines for people are the same as people finders. What will they help you with? They will get the details of anyone you need to get info on - or someone you need to locate. The difficulties start when the lost person has left the US, because then they are much harder to track down. On this page I will tell you about Kristy Edgar who would like to locate the man who is the father of her boy. The man does not know that he has a son in the US, so it would be important that she finds him so that she can tell him! So, this woman needs to find Juan who most probably moved back to Mexico several years ago. I do have one page on this website where I explain what you can do if you want to locate someone who lives in that country. But in reality it might be harder than it seems. If you came here to find some good people finders, see this page! I have not seen this person in 13 years. I met him at a laundry mat in Naples, Florida. 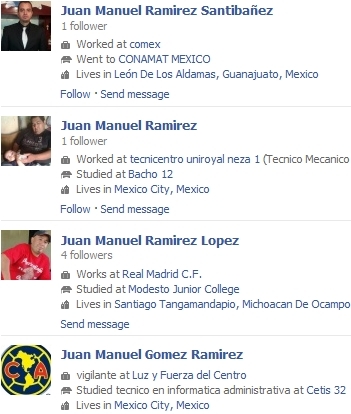 His name is Juan Emanuel Remmirez. He would know my kids and I as Kristy, Christian, and Howy. He last lived with his cousins in Naples, Florida. They had a tiny apartment on Pine street. Juan would now be around 45. All I know about his family is that he had a father living in Ohio, and a mother living in Mexico. He may have had a brother. Juan used to work at a place called Scrubbing Bubbles. He did have a valid state of Florida license. I believe he got it at the Secr. of States office in Immokoli Florida. He at the time owned a 4 door white auto which he had crashed in Naples. I have looked up a few leads and called a few people. All I could get for info on him was that he had went back to Mexico. What he doesn't know is that he has a son now 13 years old. I can't tell you much else about him other than he was very kind to us. Any help would be appreciated. Here is one affordable search engine to try out. Answer: Hey Kristy, I will try to help. And maybe other people who see this will help too. You can all comment at the bottom of the page if you know something. Kristy, you are a hero having raised your son alone. I am sure your 13 year old is thankful to have you as a mother! I did a search for you on one of the most common search engines for people, but there was basically nothing on these on him. Seems like the internet doesn't have anything on this name. Google finds nothing. 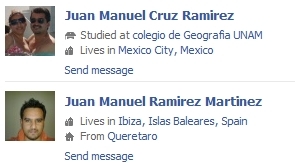 It suggests that I type in Juan Manuel Remmirez instead of Emanuel.. I wonder if you have the name wrong? Another idea would be to go to Juan's old workplace. Ask if they have some records on him or something that could be useful for you. Maybe his old address in Mexico..? Explain the situation as it is, people are often more understanding than we give them credit for! Facebook also acts as a search engines for people at times, so I checked there too. They say the same thing about the name. They also suggests that the surname is incorrect. Click on the pictures to see better. There were lots of profiles using that name. And other very similar names of course. Do you recognize any of the Juans here on the pics? You could also talk to this friendly private investigator. so that could be a solution for you in this case!